Audio Suspension launches range of acrylic hi-fi wall-mounts | What Hi-Fi? Audio Suspension is a new name to look out for when it comes to equipment racks and mounts, with the ASU-100 the company's debut product. 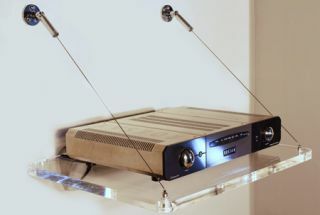 Made in the UK and based in Brighton, the Audio Suspension ASU-100 uses "high-grade 20mm low-resonance acrylic" and has adjustable wire supports that connect to your wall. Set to be the first product of a range, the ASU-100 aims to limit unwanted resonance without adding its own noise and colour to your system's sound. The ASU-100 is secured to your wall using two polished-chrome supports, each damped with silicone-rubber at the connection point. Two 1.5mm steel-wire cables then holds the shelf, allowing to level and adjust the angle. Suitable for equipment up to 470mm x 420mm, and capable of supporting up to 25kg (dependant on fixings), the ASU-100 is available now directly from the Audio Suspension website for £250. Audio Suspension also offers a bespoke design service for different sizes and colours and for larger, heavier products.